Managers of the public utilities were high in their praise for their employees. “Employees of the T&TEC Northern Area had to crawl on their bellies to gain access to their switching stations which was located on Park Street, the northern boundary of the 24 hours curfew. The Red House never lost power during the attempted coup. Most personnel who were on duty when the crew started remained there until Sunday when curfew passes were received. At the Water and Sewage Authority (WASA) the reports were that there was no significant service disruption. The maintenance crew was equipped and dealing with everything every; shifts were manned with persons who were on vacation reporting to work in an effort to contribute positively to the resolution of this coup. The regional manager for the Northern Division was responsible for acquiring samples of water and getting it tested to ensure the quality of the water being delivered was not compromised. WASA was able to assist the Defence Force by provision of vehicles for their use. Some of their vehicles were also used to transport nurses, medicines and food supplies to police stations and the Port of Spain General Hospital. At Public Transport Service Corporation (PTSC) they had a shuttle service for nurses, media personnel with their bulky equipment and for police officers. They also had sufficient drivers to operate regular bus service during the allowed hours. These services were manned by staff who volunteered their time. MLIO is a Non-Governmental Organisation (NGO) that was formed in 1986. In response to the chaos and looting, MLIO decided to form a Task Force. They used their trade school, specifically the welding department of MLIO, to do repair work for companies which had sustained damages following the massive looting that occurred in the East-West corridor during the insurrection. The work, estimated to be in the region of $900,000 was all done gratis. MLIO was also responsible for the voluntary cleaning of the Parliamentary Chamber. These chambers had been in utter disarray after the 6-day siege. While cleaning the Chamber and surrounding areas, the Task Force came upon two Maces which were badly damaged. They called the Speaker and offered to have the Maces repaired. The cost of repair was borne by MLIO’s membership and donations solicited by MLIO. Acting Deputy Commissioner of Police, Leslie Marcelle, showed tremendous bravery, leadership and initiative in organising panic-stricken members of the public. His leadership also manifested in mustering a number of Police Officers who were at Police Headquarters, with intentions of responding to the gunfire targeted on Police Headquarters by the Jamaat-al-Muslimeen. It is believed that the Army’s strategic handling of this unprecedented national crisis was what led to the eventual end of the attempted Coup. One action specifically mentioned as an appropriate response was Captain George Clarke’s deployment of “a Platoon minus” to the area of the Queen’s Park Savannah about 4.30 a.m. on Saturday. This unit was a rag-tag team, consisting of 22 men of such soldiers as were available to Capt George at the time; because of the nature of the crisis, much of the Defense Force was spread very thin. Within 9 hours, he had deployed. Soon after midday on Saturday, the forces under the command of Capt. Clarke and Major Antoine had compelled the Muslimeen to retreat into TTT and remain confined therein. The Army had effectively contained the insurgents inside TTT. They were now surrounded by the Army with heavier fire power and manpower. By Saturday afternoon, at the Red House and TTT, the captors had become the captives. On the evening of the insurrection, the Chief Fire Officer issued a “Call Out” to all officers but advised caution because of the violent and dangerous situation in Port of Spain. In their attempt to respond to the blaze at Police Headquarters, Fire Officers were met with gunfire from members of the Muslimeen. They were forced to reverse away from the Red House and Police Headquarters. They were finally able to gain entry to the Police Headquarters on the Edward Street side of the Headquarters and they rescued 120 persons. However, the Fire Service estimated that 116 buildings in downtown Port of Spain suffered extensive fire damage and the value of losses was estimated at $125,663,416.00. The medical staff, nurses, radiographers, attendants, technicians and security personnel worked excessively long periods at the Port-of-Spain General as they were dealing with injuries from three sites: Red House, TTT and looting in downtown P-O-S. On average, there were always approximately 12 doctors and 18 nurses in the A&E department at any time. The A&E department saw 560 persons during the period 27th July to 1st August. 302 were admitted to wards; 250 were treated and discharged; 8 died. 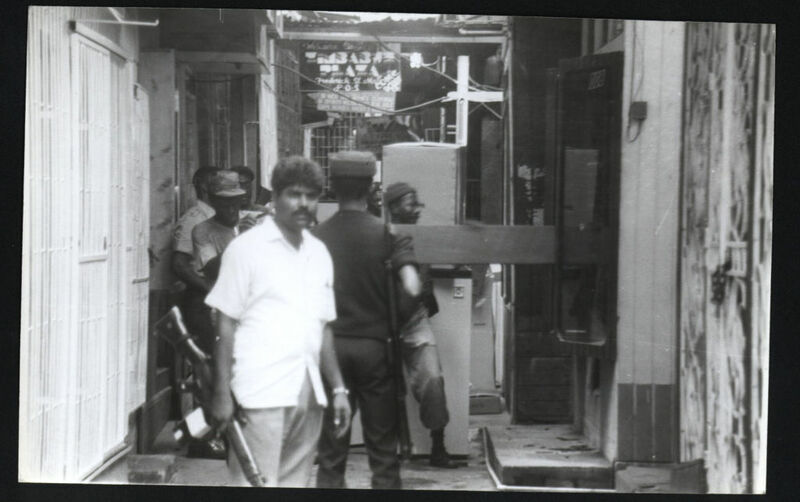 Of the 250 treated and discharged, 54 were coup-related and 23 of those were injured while looting. 10 suffered blunt trauma injuries; 8 had gunshot wounds; 3 were stabbed or chopped and 11 seemed to have been injured accidentally. For their commitment to duty in a highly charged situation and their dedication to duty these individuals must be commended.